The overall budget for Metrobus and GoBus is essentially unchanged for 2019 from 2018. Metrobus is subsidized by the City at 64.75 percent. 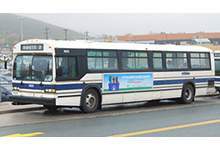 Revenues for Metrobus and GoBus include passenger fares, reimbursements from other municipalities receiving the services and small government operating grants.